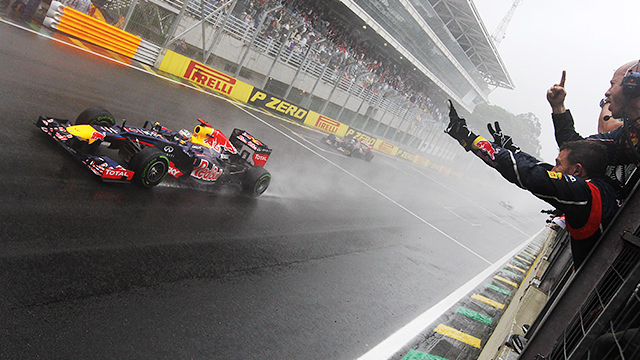 Welcome to F1Minute - Sebastian Vettel wins the 2012 F1 World Championship. Sebastian Vettel crossed the line in sixth place at the Brazilian Grand Prix, securing his third F1 World Championship in a row, and becoming the youngest driver to pick up three titles. It was a worrying race for all involved, after Vettel was knocked to the back of the field at the start, picking up some damage to the exhaust. We even saw Adrian Newey sitting on the pit wall studying a printed picture of the damage to the car, presumably trying to figure out how race-threatening it really was. In the end, Sebastian worked his way through the field to sixth, doing just enough to win his third title.